Nearly everyone has heard of The Nutcracker, but how many people could actually tell you the story? With the Nutcracker Story Summary and FunLib, students will not only learn the plot of the story that inspired the famous ballet, but they will also have fun creating a silly version of their own. 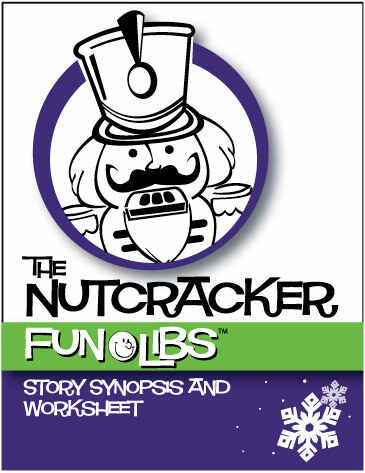 With Christmas just around the corner, The Nutcracker FunLib Story and Worksheet is the perfect way to familiarize students with a culturally significant story while maintaining the holiday spirit of fun and celebration. As the holidays grow closer and student attention spans diminish, an activity like this one is the perfect choice. Whether you are in a music classroom in those final days before winter break, or whether you want to add a little something different to your home school music lessons or piano lessons, your students can have some fun without giving up on learning. The first page gives a concise summary of the story, while the second page leaves significant blanks for students to fill in the nouns, verbs, and adjectives of their choice– without looking at the context. When all the blanks are filled, students will have a one-of-a-kind version of the story. The Nutcracker FunLib would make a great companion to any study of Tchaikovsky or any of his magical music from The Nutcracker ballet. The Nutcracker Venn Diagram, for example, guides students to compare and contrast two different movements of The Nutcracker. All you need for a seasonal listening lesson is a recording of two movements of The Nutcracker and this free printable worksheet. The diagram’s simple design allows you to choose any two movements you’d like to focus on. There are plenty of great listening options, from the mysterious and playful Dance of the Sugarplum Fairy to the exhilarating Russian Dance or the majestic Waltz of the Flowers. You are also free to provide however much or little guidance you would like, based on your students’ ages and musical knowledge. Students of any age will enjoy hearing these timeless seasonal pieces. Who Wrote the music of The Nutcracker Ballet? Peter Ilyich Tchaikovsky was born in 1840 in present-day Udmurtia, Russia. His father was a Ukrainian mining engineer. Peter began piano lessons at the age of five, and within three years he could read music as well as his teacher… Read more.